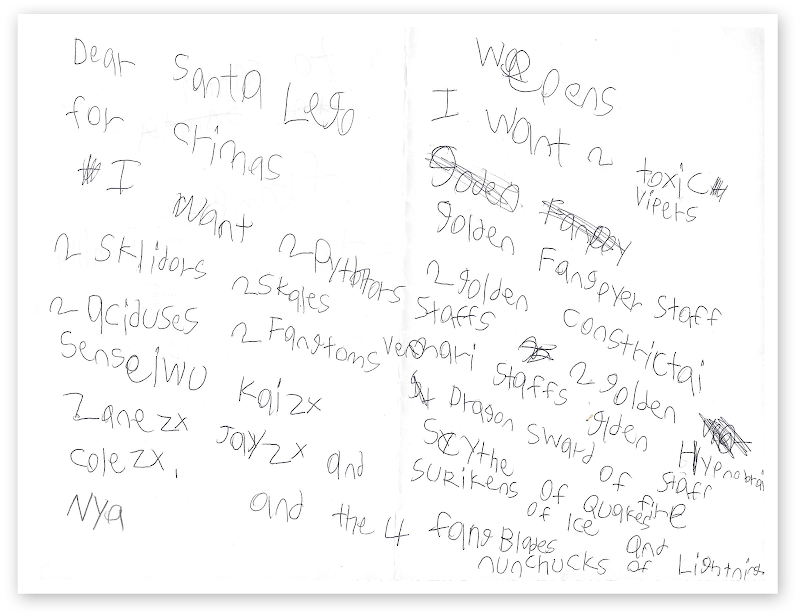 For Christmas I want 2 Pythors, 2 Skalidors, 2 Skales, 2 Acidicus, 2 Fangtoms, Sensei Wu, Kai ZX, Zane ZX, Jay ZX and Cole ZX, Nya and the 4 Fang Blades weapons. I want 2 Toxic Vipers, Golden Fangpyer Staff, 2 Golden Constrictai Staffs, Golden Hypnobrai Staff, Dragon Sword of Fire, Scythe of Quakes, Surikens of Ice and Nunchucks of Lightning. 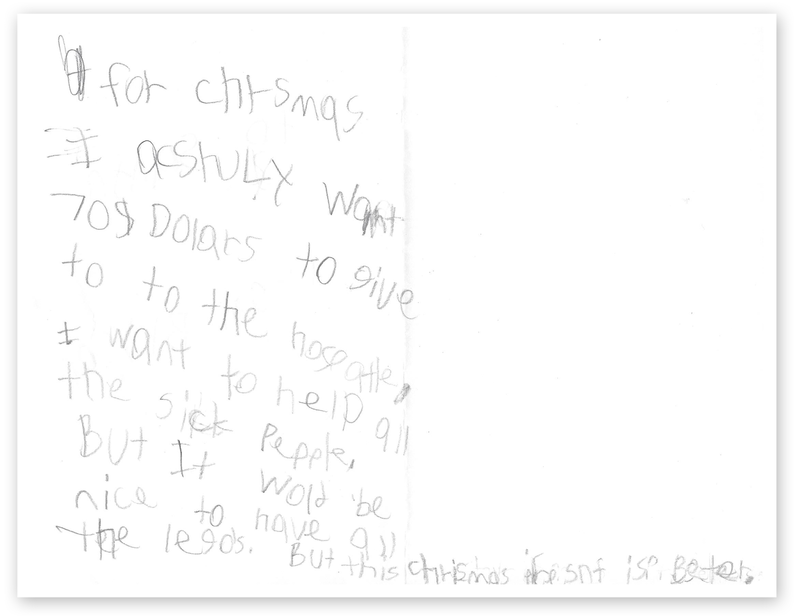 "For Christmas I actually want $70 dollars to give to the hospital. I want to help all the sick people. But it would be nice to have all the Lego's. But this Christmas present is better." FYI: $70 is what we've told him his Christmas budget is ($10 for each year of age). When I read it, tears started streaming down my face and I was completely speechless...and to be honest, also quite shocked! I asked him if he was really being serious and if he was really willing to give up everything on his Christmas list to help the sick kids at Carlee's hospital (Primary Children's) and he looked into my eyes with absolute sincerity and told me "yes." For the past 15 or so years, I've kept a book of hero's where I list the names of people who have touched and influenced my life in great ways and have helped me become a better person. This 7-year-old kid made it into my book of hero's tonight. His simple choice was a great reminder to me of what it means to truly "share The Gift" this Christmas and always. 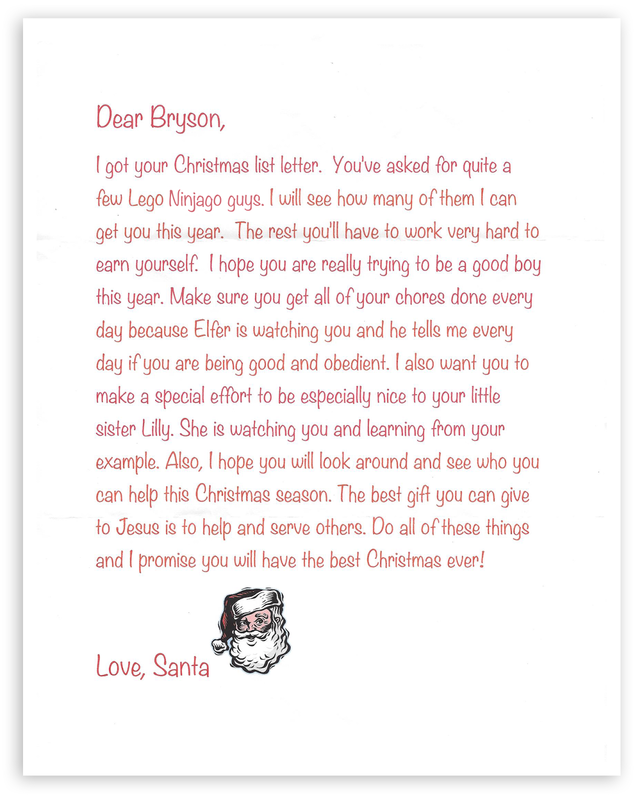 I am so grateful not only for Bryson, but for all of the sweet little children that surround us on earth because they are often so wise beyond their years. They teach us, they humble us, and they show us through their innocent examples how to be more like the Savior and bring glory to His name. "You don't have to be larger than life to be a hero, just larger than yourself." P.S. Another Carlee update is coming soon!